Type A is a collaboration of two multimedia artists. One central theme of their work is the relationship between victim and aggressor; to reflect this, we divided the space along a central axis. The two sides are separated into BLUE and RED, which are the colors worn by the artists in their films and photography. This spatial duel stops at the windows where the building's façade creates a perch over the city. 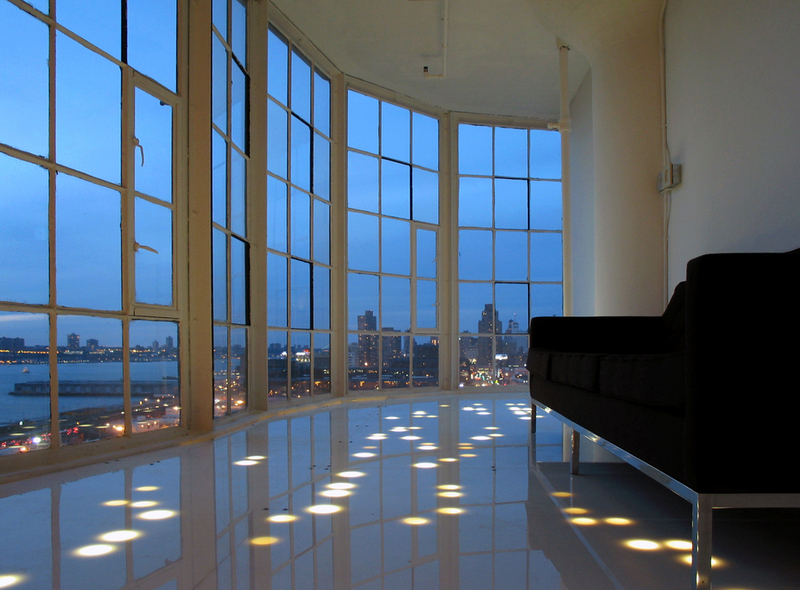 To heighten this experience, we constructed an elevated lounge that is level with the bottom of the window frame. The lounge platform consists of ¾" plywood perforated with a stepping grid pattern and covered with a layer of translucent plastic. Lights placed underneath the floor filter through the perforations and create a subtle glow, recalling the city lights in the distance.